Progression from Meaningful Use Stage 1 to Stage 2 requires eligible professionals (EPs), Eligible Hospitals (EHs), and Critical Access Hospitals (CAHs) to have satisfied the core objectives and other Meaningful Use Stage 1 requirements for two years, with progression to Stage 3 requiring 2 years of meeting Meaningful Use Stage 2 requirements. Meaningful use requirements are cumulative, so as EPs, CHs, and CAHs progress through the stages, they are required to continue to demonstrate meaningful use of the objectives of the previous stages, on top of meeting the additional objectives of the new stage. The aim of Stage 1 was to implement EHRs and their associated technology, to meet 15 core objectives – 14 for EHs and CAHs – and achieve a minimum threshold in those objectives, satisfy five menu objectives and six clinical quality measures. The Meaningful Use Stage 2 requirements differ slightly from those in Stage 1. Some core objectives have been combined and others eliminated, although most continue in Stage 2. The difference for Stage 2 being an increase in the minimum thresholds that must be achieved. Meaningful Use Stage 2 requirements for EPs involve meeting 17 core objectives, three menu objectives from a list of six, or 20 core objectives. 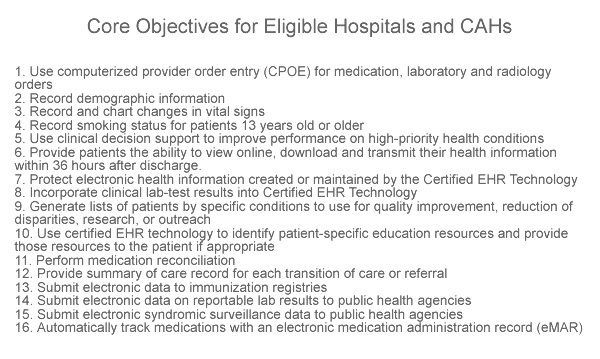 CAHs and EHs are required to meet 16 core objectives and 3 menu objectives, or a total of 19 core objectives in order to receive Stage 2 incentive payments. 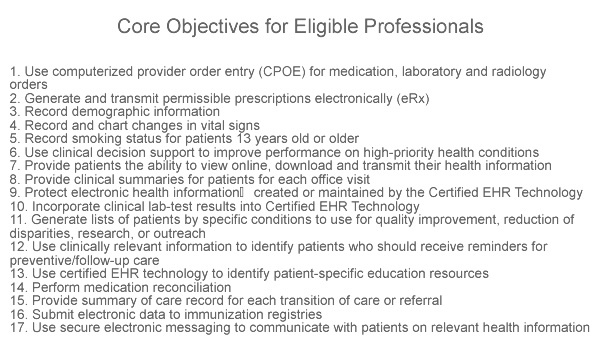 The additional core objectives for Stage 2 relate to electronic messaging. 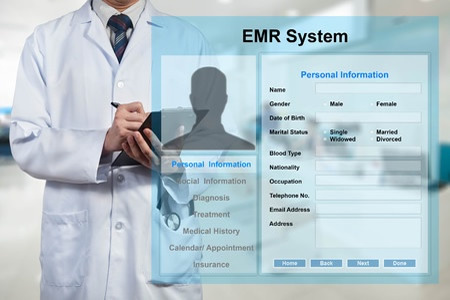 EPs must use secure electronic messaging to communicate relevant health information with patients, while EHs and CAHs must track medications automatically from order to administration using assistive technologies, in combination with electronic medication administration records. These new core objectives are intended to benefit patients by improving safety and care. Some of the core objectives required in Stage 1 have been altered for Stage 2. One of the core objectives in Stage 1 was to provide patients with electronic copies of health information on request. In Stage 2, this changes to providing patients with electronic copies of health information online. The timescale for providing access to online health information differs for EPs and EHs/CAHs. EPs have to provide access within 4 days of the request being received, while EHs/CAHs have to provide access to online health information within 36 hours of discharge from the hospital. In both cases, patients must have the ability to view, download, and share their health information. More than 5% of patients seen by the EP – or admitted as an inpatient/seen by the emergency department – must view, download, or share their health information. In Stage 1, EPs, EHs and CAHs were required to exchange key clinical information with providers of care when patients transitioned or were transferred to other providers in at least 50% of cases. Stage 2 also requires summaries of care provided to be issued electronically for more than 10% of transitions/referrals. Further, when a patient is referred or transitioned to another care provider, it is necessary to conduct at least one successful electronic exchange of a healthcare summary with a recipient using technology designed by a different EHR developer than that of the sender of the information. Alternatively, it is necessary to run at least successful one test with the CMS designated test EHR during the reporting period. While Stage 1 required reporting on clinical quality measures, this requirement is removed from the core objectives in Stage 2 although to demonstrate continued meaningful use, all providers must report on CMQs from 2014. EPs are required to report on 9/64 CQMs and EHs and CAHs are required to report on 16/29 CQMs. The Meaningful Use program commenced in 2011, so the earliest that an eligible professional / eligible hospital could progress to Stage 2 was in 2013. However, the CMS delayed the start of stage 2 until 2014, so any provider that started in 2011 is required to continue to meet Stage 1 objectives for a further year.